Scaffolds and ladders can be very dangerous for workers if not set up properly. Each year thousands of construction workers are grievously injured – and some even killed – by falls from unstable scaffolds and ladders. 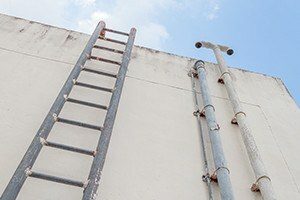 If you or a family member has been hurt due to a fall from a scaffold or ladder while working at a construction site in the State of Washington, you may have the right to make a claim against the contractor responsible for supplying the scaffold or ladder, if the injury was caused by an improper set up. Scaffolds must be regularly inspected and maintained by qualified personnel. Like scaffolds, there are different WISHA safety regulations that apply to different types of ladders, depending upon whether the ladders are fixed, portable or multi-sectional. Washington Administrative Code § 296-876 applies only to ladders and contains over 40 different specific safety regulations. Contractors are required to use certain types of ladders for certain types of applications, but in every application must keep the ladders clean and in good repair at all times. Fixed ladders are subject to specific height limitations and must incorporate certain safety devices, such as cages and grab bars. Portable ladders must always be set up so that they are level and stable at the bottom; if the top is subject to any movement, it must be secured. Additionally, the correct length of ladder must be used so that when the ladder is placed against a structure it can be placed at the proper pitch: when the ladder is in place, the horizontal distance from top to bottom must be one quarter that of the length of the ladder from top to bottom. The most important regulation of all requires workers to be trained and required to face the ladder when going up and down, and to always grip the ladder rails with both hands, which means that the hands must be kept empty and free at all times – tools and equipment must be carried on a belt or backpack, or hoisted into place. When scaffolds and ladders are properly set up and maintained, and when workers are properly trained to use them, falls rarely happen. But when contractors cut corners and fail to follow safety regulations enacted under the Washington Industrial Safety and Health Act [WISHA], such injuries are likely to occur. Workers injured due to safety violations should not accept the blame causing their own injuries, but should look to holding any negligent contractor responsible, since the contractor is responsible for knowing and following the stage safety regulations. Every contractor is required by law to have a written fall protection program, and is required by law to inspect each and every job site for potential fall hazards. The law does not leave fall protection to chance, with the construction worker bearing all of the risk of injury. Fall protection safety rules are strictly enforced. The lawyers at Kraft Davies, PLLC have done nothing but represent injured workers for many years. We have practiced together for most of our careers, which give us a combined total of 83 years of construction personal injury expertise. We know what it takes to put a construction personal injury case together in order to maximize our injured client’s settlement/verdict potential, and we don’t mess around, since we don’t get paid anything if we don’t win your case. Over the years we have successfully litigated and resolved several cases for clients who fell from unsafe scaffolds and ladders and sustained serious injuries, including multiple fractures, brain trauma, and spinal injuries. Some were able to return to work, but some had to abandon their careers in the construction trade. The recoveries that we obtained from the negligent contractors for those who required retraining to a less strenuous line of work made their career transitions possible, and their families more comfortable. Kraft Davies, PLLC is based in Seattle, but we represent injured workers from all over the state, in every county and federal court in Washington. If you hire Kraft Davies, PLLC, you will pay us no fee unless we win financial compensation for you! For your free, no obligation consultation, call Kraft Davies, PLLC today at 206.624.8844. Alternatively, you may email your inquiry to us by clicking here.